About "All of Grace (Moody Classic Series)"
Now with a new foreword by Rosalie De Rosset. In an age of limited travel and isolated nations, C.H. Spurgeon preached to over 10,000,000 people in person-sometimes up to 10 times per week. 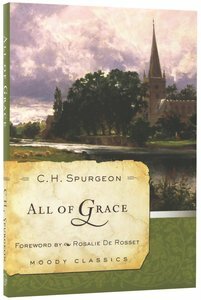 It is in this classic work that Spurgeon most clearly presents the message of salvation-man's ultimate need and God's unique provision-both simply and sincerely, for honest seekers and zealous witnesses alike. 2. What Are We At? 4. "it Is God That Justifieth"
11. I Can Do Nothing! Discover the wonders of effective prayer from one of the greatest prayer warriors ever! George Mueller (1805-1898) dared to take God at his word, and on the basis of prayer alone was able to establish orphanages and schools that saved over 10,000 children from the horrors of poverty in Victorian England. 128 pages, from Moody Press. GEORGE MUELLER (1805-1898), evangelist and philanthropist in England, was a man of prayer and strong faith who depended wholly on God for his temporal and spiritual needs. During his time serving as pastor at a church in Bristol, England, his famous work with the orphans began when two young children were thrown upon the church's care. Mueller resolved never to tell anyone what his needs were. He told them to God and confidently expected them to be met. Over his life, he handled more than $8 million, although his own worldly possessions were valued at about $800 at his death. He is author of the book Answers to Prayer. DR. ROSALIE DE ROSSET is a professor of Literature, English and Homiletics at Moody Bible Institute where she has been for forty-two years. She earned her M.A. in English from Northeastern Illinois University, M.Div. from Trinity Evangelical Divinity School, and Ph.D. in Language, Literacy, and Rhetoric from The University of Illinois at Chicago. In addition to teaching, she regularly appears on Moody Broadcasting Network programs as a guest and co-host, and speaks at conferences and seminars. She lives on the northside of Chicago. When George Mueller could not get it out of his mind to open a house for orphans in late 1835, he purposed to do so "that God might be magnified by the fact that the orphans under my care are provided with all they need, only by prayer and faith." For over sixty years George Mueller wrote down the details of the Lord's provision. Thousands of orphans depended on Mueller, and Mueller, in turn, depended solely on the Lord. Prayer is an urgent matter that always yields crucial results. Through his narrative account, Mueller reveals how powerful and spiritually rewarding prayer can be in your life. Moody Publishers is honored to introduce the first six volumes in what is to be an ongoing series of spiritual classics. Selected for their enduring influence and timeless perspective, these new editions promise to shape the lives of spiritual pilgrims for generations to come. For over sixty years George Mueller wrote down the details of the Lord's provision. Thousands of orphans depended solely on Mueller, and Mueller, in turn, depended solely on the Lord. Prayer is an urgent matter that always yields crucial results. Through his narrative account, Mueller reveals how powerful and spiritually rewarding prayer can be in your life. "The cross is the key to all situations as well as to all Scripture." By relating to cross to the life of the believer, L. E. Maxwell shows how an understanding of our identification with Christ in His death and resurrection can lead to a life of consecration and discipline. Living in the perspective of the cross will enable you to have both victory over sin and power in your life for God's service. This book remains an unequalled expression of the necessity of holiness in the life of every Christian. Although affirming justification by faith alone, Bishop J C Ryle (1816-1900) stresses that "A cheap Christianity without a cross will prove in the end a useless Christianity without a crown". 276 pages, from Moody Press.